The platinum print has long been called “the price of all media” and was utilized by masters ranging from Frederick Evans to Alfred Stieglitz, Imogen Cunningham, and others. 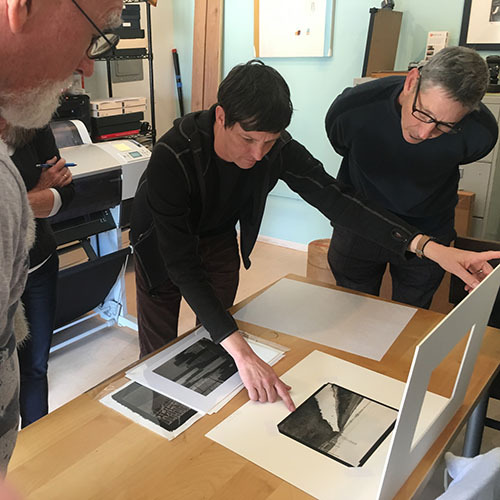 This workshop helps participants who are already fluent in platinum/palladium printing to refine their technique and learn more nuanced practices for articulating their work. This workshop is currently filled, please email info@mediumsandiego.org to join the waitlist. Join Medium for our an opportunity to dive deeper into platinum/palladium printing with founder and Executive Director scott b. davis. In this two-day workshop participants will refine the time honored technique of platinum/palladium printing, taking opportunities to print on unique papers and try large scale printing up to 11″x14″. Limited to three participants, this in-depth workshop is offered exclusively to individuals with a working knowledge of platinum / palladium printing. The workshop will include a thorough review of making digital negatives and explore the depth and character of the platinum print, with special attention paid to finishing and presentation of finished prints. Participants can expect to take home between 2-4 prints, and will be offered resources on a refined workflow and setup, in addition to advanced applications of digital negatives in relation to modern printing papers. The goal of this workshop is to help others develop an enriched understanding of platinum/palladium printing with special attention paid to the unique approaches offered through the use of digital negatives. Resources and access to all facets of platinum printing will be offered, with individual attention given to the unique needs of each participant. scott b. davis is an artist and founder of the Medium Festival of Photography. His photographs are created with wooden view cameras ranging in size from 4” x 5” to 16” x 20”. Since 1996 he has made prints by hand using the exquisite 19th century platinum/palladium process. He has exhibited photographs across the world and had his work reviewed in print editions of the New York Times, the Village Voice, the New Yorker, Los Angeles Times, and others. scott b. davis’ photographs have been collected by the J. Paul Getty Museum, Pier 24, the Nelson Atkins Museum of Art, the Santa Barbara Museum of Art, Kiyosato Museum of Photographic Arts, and other prominent collections.